Let Real Green's Lawn Club get rid of your foraging intruders, once and for all. Our Deer repellant program provides year around protection. We apply a professional strength game repellant, this environmentally safe product, used commercially in parks, playgrounds and many public places. The active ingredient of this product is "Bitrex" the most bitter tasting substance known to man. "Bitrex" is combined with an odor re-enforcement, to warn the trespasser not to feed from the treated plant again and a latex additive helps the product last for three to six weeks. THE GUARANTEE? 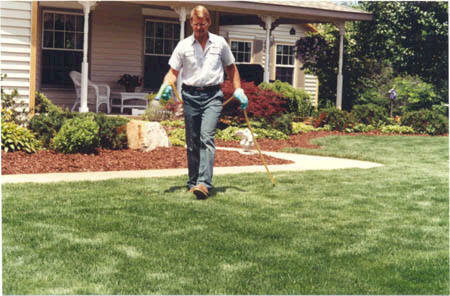 Real Green's Lawn Club guarantees control, 4 weeks after the treatment and will retreat as necessary.